My introduction to triathlon began at a young age, watching my dad compete at Ironman Arizona when I was seven years old. I remember watching him race against thousands of other people, pushing their bodies to the limit and accomplishing something incredible. At the time it was not appealing, I wanted to just play soccer and have fun with my friends. But some part about me wanted to accomplish what those people did. I wanted to know what it was like to get out of my comfort zone, and push my own limits. I was born with bilateral radial club hands. My right forearm is significantly shorter and doesn’t function well. My left arm is also affected but to a lesser degree. I was limited in my options for sport because of my disability, so when I was eight years old, my parents had me and my brother Christian join a local swim club, the Cochrane Comets. There were a lot of kids my age in the club. I was frustrated with being slower than my peers, and blamed my disability. It was discouraging, and I felt like my effort was pointless. Lazy people were out-swimming me, and it didn’t sit well. Christian has cerebral palsy, making it difficult for him to walk or participate in most sports. He was the slowest in the club, but he always had a smile on his face and a positive attitude. He always worked harder than anybody else. He loved what he did and never used his disability as an excuse, no matter what. Seeing someone with his attitude influenced me at a young age, and he is the reason I am still in sport today. I began to see my disability through a new lens, as a challenge to overcome, rather than an excuse to perform poorly. I began to realize what others did was beyond my control. I learned at a young age not to let circumstance dictate where I wanted to go in sport. I have always looked up to Paralympic legend Brian McKeever — in addition to becoming Canada’s most decorated Paralympian, he was able to qualify for both the Olympic and Paralympic Games. He gives all Paralympic athletes hope for equality, and allows us to dream. I think it is important to set big dreams in order to push our threshold on the training and playing field. Competing in both Games is something I have always wanted to do. I began to compete in local Kids of Steel races in B.C. and Alberta. I would do well on the swim and run, but I always got torched on the ride because my bike was about ten sizes too small. I had difficulty controlling the bike due to my lack of grip strength, and I had poor posture from having two different arm lengths. I was introduced to some cycle specialists in Calgary, who adapted my bike so that I could safely ride and be balanced with one arm shorter than the other. Triathlon was more of a side sport for me until 2013, when they announced the 2016 Paralympic Games in Rio would feature triathlon. I knew I had a legitimate shot, so I began to train more seriously and became more invested in the sport. I had initial success at the Worlds. I captured a bronze medal at the Para-triathlon World Championships when I was 16, and went on to silver the following year. Continuing to push myself, I competed in junior elite racing (able-bodied) as well. This proved valuable for my para-triathlon training and preparation. I could bike and run as well as anyone else, but my swim was always my weakness. I worked on it every day, hoping it would eventually help me become competitive at able bodied sport, but even more importantly stand on top of the podium in Para-triathlon. I got close on the swim in 2014, but in 2015 my hard work paid off: I won the Canadian Junior Championships (able-bodied), and proved to myself that just maybe the Olympic dream isn’t the craziest goal ever. My improved swim had given me a chance to be competitive in the race, and I gained a ton of confidence and motivation. 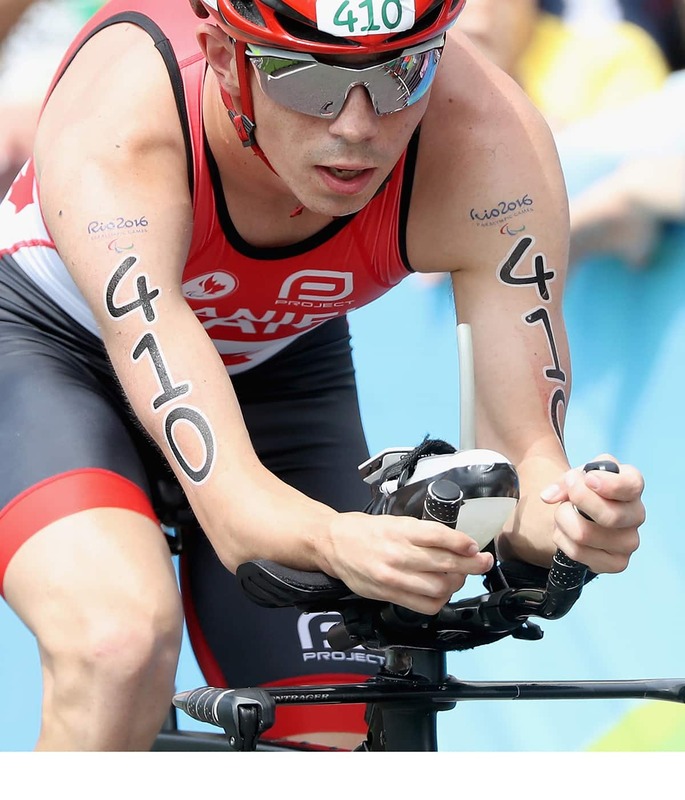 The momentum carried me through the rest of the season, and I capped it off by winning my first Para-triathlon World Championship title that year in Chicago, qualifying for Rio 2016 in the process. I was excited going into the 2016 season. I took the year off school and moved to Victoria to train with the National Team. In hindsight, it was too much change, too fast for me, and I didn’t handle it well. I got too involved in my training and I over-analyzed every workout. The pressure of the Paralympic year got the best of me. This was the first time I wasn’t in school, and I had nothing to take my mind off training. A bad workout would affect my entire day. It began to show in my racing, and I went into Rio with low confidence. The 2015 season showed me that I had a shot at gold, but 2016 rattled me. I came short of my gold medal goal. I salvaged a silver medal in Rio, and I am very proud of that. An army of dedicated support staff helped get me onto the Paralympic podium. Of course, two of those people are my parents who have been there for me throughout life’s ups and downs. Looking back on the 2016 experience with my parents and coaches on my way home from Rio, I quickly realized life balance is critical to success. I decided to come back to Calgary and return to my studies at the University of Calgary. It was important to rejoin the University’s Dinos cross-country running team and get back into an environment that was comfortable for me. Being back home, I was able to refocus and live the balanced life I needed. Having school to fall back on mentally helped my training, and I went into 2017 excited to race again. Since then, I have been consistent in my racing and have enjoyed training more than ever. The 2016 season was an important learning year. I’m confident with my new-found approach, the leadership of my coach Carolyn Murray, the high-performance staff at Triathlon Canada and my family, I can reach my goal in 2020 — winning Paralympic gold. While my primary goal is to be the best Para-triathlete in the world, I will continue to challenge myself by competing in able-bodied racing as well. I want to prove to everyone no matter what, you can accomplish anything you set your mind to. Recently, I was featured in a Nike ad that shows my frustration with people who equate Paralympians with less competent or competitive athletes. I remember hearing somebody say at a race, “Hey, there’s the para guy that can run.” I took that to heart. From that day forward, my goal has been to defy all odds and reach a high level every time I toe the start line. I will not waver in my pursuit of excellence. I will always push myself to be better in sport and life. I am determined to win more medals for Canada. A: The Illegal by Lawrence Hill. A: Unfortunately I don’t listen to podcasts. A: During a race, I yell a lot on the bike when I’m in a pack and I’m frustrated at someone. People are usually surprised to hear that since I’m pretty reserved. A: Most horror movies, especially the movie Sinister. Never watch it. A: Eliud Kipchoge, LeBron James, Eminem, Michael Phelps, Usain Bolt, Tom Brady. A: I want to try and compete against the best able-bodied athletes in the world in a few years and race in a World Triathlon Series event.